A break in the heavy pedestrian traffic outside Bloomingdale's on Lexington at the happiest time of the year! You captured this very well. The story is told very well. We’re making cocoa! Thank you so much and enjoy your cocoa. Sounds so good! It is not rain, it is the heaven that has started to cry for absents. The absents with us forever . . .
Nice shot Patti. A reminder of how dangerous shopping (at Bloomingdale) can be. The grapevine tells me it is in the 40’s in Colorado Rockies, semi-tropical. Hope it is now warmer for you in Mexico and thank you for kind words Brian! Excellent image Patti and remember “it’s the most wonderful time of the year” 🙂 I’m surprised the umbrellas weren’t inside out with that wind yesterday. How I wish I could forget about it being the most wonderful time of the year . . . grrr, that song plays over and over everywhere but it was the “happiest time etc” loop that lodged and stuck itself in my tired brain. Wasn’t that wind wild! I managed this shot in a brief lull, between blows! Ah, yes! I remember Bloomingdale’s. Thank you Emilio, I am very happy for you and do hope the memories are warm ones! Very good photo, the colour too. I can feel the rain. Enjoy feeling the rain without feeling the pain, thank you Bente! This is so good, Patti! Love the atmosphere and the reflections in the rainy sidewalk! Thank you Susan, the atmosphere certainly looks better than it felt at the time! Got to say, not seen rain like that for awhile! Even here in London. This is an excellent study in street photography and life, Patti. The reflection from the headlight, the rain and finally the special atmosphere. Great captured and composed. Thank you so much for your kind words Stefan! It is always such a crowded part of town I don’t like spending any more time there than I have to which is strange to say because I normally love crowds, just not shopping crowds. Good shot. Shimmering and all very wet looking. The man with the plastic bag is walking resolutely and with purpose. What does he carry in that bag? Perhaps he is on his way to the Laundry-mat or it could also hold his emergency supply of clothing having been chucked out of his lodgings. Who knows? There is so much going on in people’s lives. Opposite is Diesel. That’s were for a lot of money people buy clothes that have been torn and abused to rags. It is not easy to get this poor look and many strive to reach that level but only a few attain it. I have failed in that daddy, please forgive me. Around the corner from here is one of the oldest dive bars in the city in one of the oldest buildings, now due for demolition and new high rise . . . sad. You are right about so much going on in life. That could well be Mr Kuche – he likes a good plastic bag now and then for his bits and bobs! Wow, Patti! Great duotone, or should I say tritone? I think you have mixed a greeny-grey into your tinting. The super-wet looking rainy day subject matter is always fun, and you know that I’m a sucker for those deep dark shadows. Thank you so much Master of the Deep Dark Shadow Allan! I was trying to get a little “diesel” into the look! That slippery surface with the heavy winds was a mucky day at best . . . 😦 Looking forward to next time you are in NYC Zita, with or without going to Bloomingdale’s! Love the bluish tint on this. Very nostalgic. What a great shot Patti, such heavy rain! 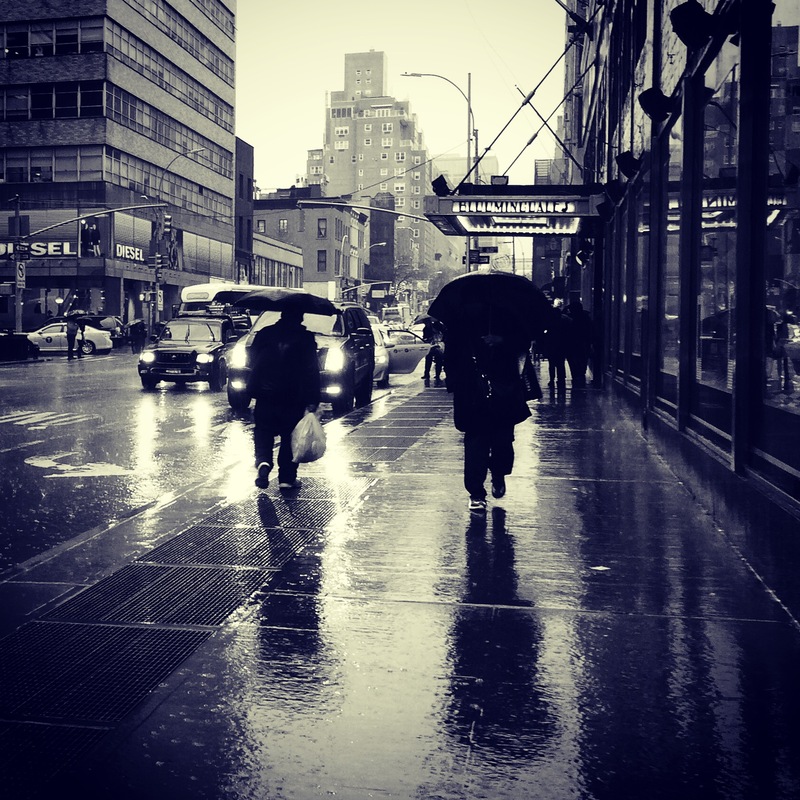 Thank you Elina, NYC does heavy rain so well! We’ve had some heavy rain here too. The good thing about it is the reflections you can capture in the streets, like you’ve done here. Great shot! Hope you are having fun getting some good rain shots where you are Cardinal, and thank you! You amaze me, Patti! How do you not get your camera wet??? Thank you Annie but I have now worked out how to keep an open umbrella under my arm and over my head without getting parts of it clouding the shot! Looking back I wonder why I was out that day let alone anywhere Bloomingdale’s, thank you Madhu! Thank you so much Richard, I now feel the day was worth something . . . you know those days? Yes, I do. Hope you had a better one today. Not exactly a Christmas picture. Or a “happiest time” entrant, either. But wow, is it striking and dramatic, and just what it feels like to be shopping soaking wet in Manhattan. Thank you Judith! It’s the shopping I don’t cope well with, whatever the weather, let alone Christmas songs on the Kafka loop! Great street photo, Patti. And a nice way to see it too! 🙂 It’s raining since days in the Rhine Valley, I miss the cold North. Sigh. And wishing you all a cozy week-end in the rainy Rhine, lovely to hear from you, thank you so much Dina! There are moments for a photographer when bad weather gives excellent photo opportunities. These are the happiest times in the year! I shall remember your wise words, thank you so much Robert! It presses on your back, this rain! Great shot. Doesn’t it just, thank you Cath! Rain is such a moody player isn’t it! Thank you Pamela! This is very evocative. I like the figure reflections on wet pavement and that slippery feel. Brilliant, Patti! What is the size of the images you upload? Thank you so much Paula, I wanted to get something out of the grizzly day . . . My image sizes vary, depending from where I upload them. I tend to go bigger with shots straight from the phone. I see. :) Well, I’d like to see more grizzly day photos. I love this shot Patti! Wonderful! Thank you so much Robyn, my attempt at getting a silver lining from the day . . .
Love your black and white street work! I love that you love it, thank you MBL!!! But at least picture-wise you made a lot of it. This is definitely one of your best pictures. Wow, thank you so much Rabirius and yes, NYC does heavy rain, with a knee-high bounce! You are very kind, thank you so much Joshi! we’ve had some rain here passed onto us from the Pineapple Express. but what a rich image it makes. love this! What an experience that Pineapple Express must be! Thank you so much Kris for your kind words and hope you are enjoying all the warmth of the season where you are! Timeless shot – good stuff! Oh, crap… double whirler beat me to it!! Regardless, this is good stuff Patti! Such an expressive shot. The slight color tint and lack of them really influence the feeling of this image. Love the reflection and the blue tones ! Jimmy Dean would not have been out of place in this shot.